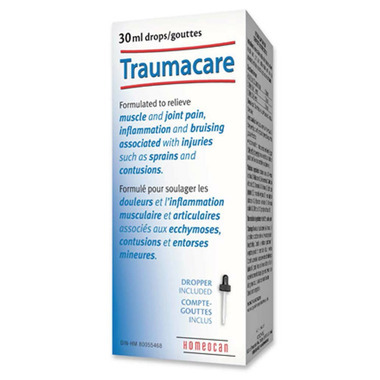 Homeocan Traumacare Pain Relief Drops help relieve muscle and joint pain, inflammation and bruising associated with minor injuries such as sprains, and contusions. Directions: Children 2 to 5 years give 5 drops every hour for up to 12 times a day. For children 5 to 11 years give 7 drops. Adults from 12 years of age give 10 drops. Recommended by our Naturalpath. I always keep on hand. A staple in our family first aid kit.